The opposition in Venezuela says their protests are about crime and inflation, but they haven’t come forward with any concrete proposals as to how to deal with these problems, Gregory Wilpert, founder and editor of VenezuelaAnalysis.com, told RT. Wilpert says that the majority of the population are actually against the protests, because they completely disrupt their daily lives. RT:President Maduro has called for a peace conference in an attempt to meet with the opposition and resolve the current protests. Why are members of the opposition refusing to sit down with the government? Gregory Wilpert: Well, that’s a good question. I think the reason that they are refusing is because they don’t really seem to have very clear demands and they are very internally divided right now. That is they say the protests are about crime and inflation but they haven’t come forward at least with any concrete proposals as to how to deal with these problems. So it’s not very clear what they would even talk about even if they were to meet with the government. RT:While the nation's economy, crime rate and lack of basic food supplies prompted the protests, what is continuing to fuel the aggression? GW: Well, I think it’s actually also a battle within the opposition for the upper hand, with certainly those issues – the inflation and the crime rate – but it has to recognize that there is a diminishing or very small group really that are blockading the streets and engaging in confrontations with the police. It’s really only a very small handful, according to some polls actually over 70 percent of the population is opposed to these protests because they are completely disrupting their daily lives, because of the street blockades that are going on in various parts of the country, mostly in the strongholds of the opposition actually. RT:President Maduro and others have said that other countries have had a hand in supporting the opposition and perhaps even planning a coup. 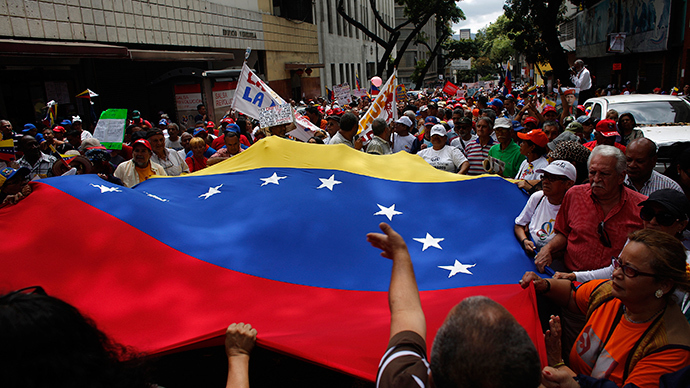 What would other nations seek to gain from the ousting of Maduro's administration? GW: Certainly the United States has opposed Maduro and Chavez for a very long time and so has the conservative government in Colombia. Both governments have in various ways been supporting paramilitaries going into Venezuela from Colombia. Also the US government [has been] supporting opposition groups with funding and with these public statements, for example, that the Secretary of State Kerry recently made, which essentially gave the opposition a shot in the arm, because he legitimated their protests even though it’s quite clear that most of the protesters are being violent and seeking confrontations with the police. RT:Last week Maduro expelled three US diplomats from the country, to which Washington responded by ousting three Venezuelan representatives. What are the implications of this diplomatic dispute? GW: I don’t think it could blow up into a larger diplomatic dispute. Both sides have said repeatedly that they do want to improve the relations and Maduro just proposed a new ambassador for Venezuela in the United States, so he is definitely interested in improving relations, but the US is actually the one that has said: “We need something to go slower, we need more positive steps,” without saying what those positive steps would be. So it seems more like that the US is less interested in positive relations than Venezuela at this moment, although of course one has to say that it was Venezuela that expelled the diplomats. But that was because they were found to have intervened and met with opposition groups.